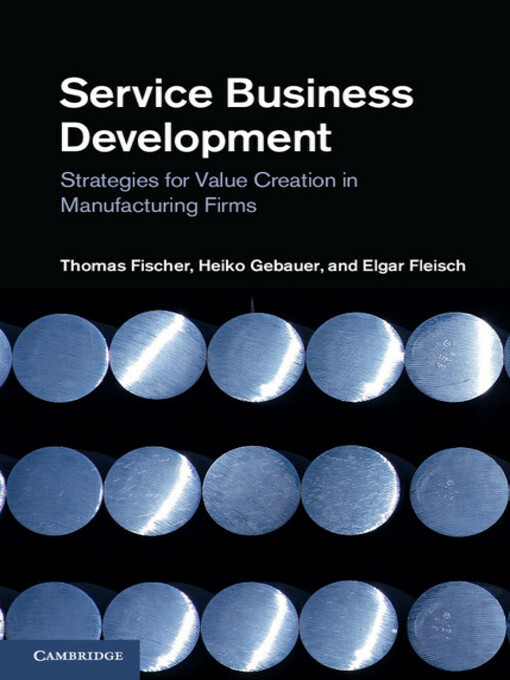 The book gives a comprehensive overview of the service business development in the business environment of capital goods and brings together years experience on how manufacturing companies can create value through services. It also discusses the challenges of how to generate revenue of the services itself (along with products) and what kind of strategies can be used in different stages and types of the manufacturing companies in global business. When developing services in manufacturing firms it is a change in value creation and leap from production minded one-off sales culture to long-term customer relationship building culture that creates value to customer in broader scale. In many cases companies do not have the capabilities required for service business development. It requires capabilities of scanning, searching and exploring the service opportunities, formulating service strategies and reconfiguring existing structures, and more importantly changing the culture to service oriented company. Services in manufacturing companies are mostly seen as product related “must to have” services that come with the product. Manufacturing companies should change their mindsets and culture to see services as equal revenue streams and in many cases to separate services into own division with their independent profit and loss responsibility. This kind of divisions of course must be in line with production and company strategy and possibly serve its global markets, avoiding parallel service development and production. Where companies used to have customer service strategy, after-sales strategy or customer support service strategy they should focus more into being a development or outsourcing partner, which can be seen as the most challenging service strategy for manufacturing companies. As mentioned before manufacturing companies should see their service strategy more likely as partnership by developing customer’s business with customised design and supporting R&D tasks for example. Different service strategies describe a lot of the level of involvement of customers business. In today’s global business environment manufacturing companies are focusing more and more into services and increasingly part of their total revenues come from services. Developing service concepts is also a crucial competition value in today’s businesses. Where manufacturing companies used to handle spare parts and seasonal repair services that were bundled to the product price they are now concentrating more into preventing the repairs and miss failures and developing their customers’ processes and R&D. This kind of approach gives an advantage to manufacturing service companies and builds barriers to competitors. In most advanced service strategies manufacturing companies act as outsourcing partners where they take on the responsibility of carrying out entire customer process. Although these stages move towards more advanced service strategies, which are normally seen as competition advantages and more revenue generating strategies due to long and strong customer relationships, changing the service strategy involves a lot of risks that are mostly seen as financial risk. This is because of the big costs required when changing strategies for example creating the service organisation, building the infrastructure and systems to guarantee the service delivery. Being a development partner requires obviously a range of capabilities that manufacturing companies must have when acting as a development partner. These capabilities cover internal capabilities from people to systems. Most important capabilities are in following areas: Corporate culture, Human recourse management, Organisational structure, Service development process and IT support of the services. Corporate culture involves corporate values where company values are very service oriented and company recognises that the joint innovation of solutions and customer processes is the main source of value creation. Company culture must give all the employees the bright vision of being a trusted advisor and should lead to learning relationship with customers. Human resource management concentrates on recruiting and training the ability and knowhow of being a development partner. It also builds the frames to payment systems. Organisational structure requires the capabilities where company is able to build inter-company collaborative structures that serve collaborative service development with customers such as separate R&D team with contact points and responsible engineers, internal knowledge network, collaboration with third parties like universities and commitment to long-term relationships. Service development process determinate the responsibilities and process for service development in structured phases : generation of ideas, development of the basic concept, business plan and development of the detailed plan/concept and launch of the service. IT support for the service business requires comprehensive systems that serve manufacturing company internally and more importantly in co-operation with customers. It is related in all the aspects of the service development and service processes from design to managing data and analysing. With networking developing, many businesses now have this as a core part of their strategy. The vertical-horizontal terminology is used by authors to indicate the dominant orientation within the network. Horizontal service network focuses on outsourcing the operation and maintenance of a diverse set of original equipment. A company delivers spare parts and knowledge intensive services for solving complex product failures. Outsourcing specialist aims at operational efficiency of the installed base and often takes over responsibilities for maintaining the installed base. IT-service providers offer remote services to watch the condition and usage of the installed base. Company offers services supporting the life-cycle of the product as well as the integration of product and services into customer-specific solutions. Although the business networks are classified as being horizontal and vertical, they are seldom purely so. Because of the most helpful use of both internal and external assets in the network, a company can grow to be innovative and able to meet competitive advantage. The value of networking for innovation is the fast building of a complex knowledge base and diffusion system of innovations. As the manufacturing companies reach a level of competitive growth with respect to their products and services, they now concentrate on their global service operations. In line with that reasoning, the authors argue that setting up a global service infrastructure is needed to enter the market for the installed base. But what are the proper organisational forms for global markets and structures of the service supply chain? 4 Separated and geocentric global service approach. In the integrated and ethnocentric global service structure, the companies that have integrated the service departments into product organisation as a cost centre are at the central, headquarters level. Locally, these companies work with sales agent or subsidiaries which sell products and offer customer services for the installed base. The behaviour of the sales agents is driven by the central product organisation and can be described as ethnocentric. Sales managers in the market organisation are recruited and developed in the home country, so that they identify themselves with the headquarters (domestic) behaviour, rather than local cultures. The key drawback is the lack of sensitivity to the service expectations of local customers and high travel costs for service delivery. Integrated and polycentric global service approach captures a situation in which the service culture can be described as polycentric and achieves medium complexity. The central organisation is like that in the first approach. However, the central organisation has a relatively low-level of authority and decision-making power. The product prices and charges for services are decided in the market organisation and it is empowered to decide how to meet the defined goals. Compared to the first organisational approach, the second one not only focuses on customer service and basic services for the installed base, but also includes some maintenance services, which are included in the product price and not charged separately. 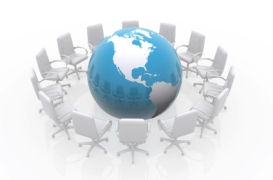 Separated and polycentric global service approach is characterised by a separation of the product and service organisation at the central headquarters level. The business unit for products has control of the following product related functions: product marketing and sales, manufacturing, R&D, and human resources. The business unit for services controls service development, spare part logistics, and service support functions. The service delivery is organised similarly as the integrated and polycentric global service approach. The disadvantage lies in the lack of communication and information flow which also limits the service standardization. Separated and geocentric service approach is becoming increasingly complex and inter-dependent. In order to enhance the collaborative approach, manufacturing companies install regional functions. Instead of having warehouses in each local market, regional warehouses are established. The separated and geocentric service approach also reinforces the separation of product and service business at the level of market organisation. The separation takes place in much large markets and leads to two different local legal entities. The first is responsible for selling products, where the second is responsible for selling services. This splitting of the local organisation into two legal entities means two administrative, controlling and financial functions, which entails much costs. Service business development is a huge potential for manufacturing companies and in many cases even the strategic area where they can grow. It should not be seen just as product related “extra”, but more likely as natural part of the product. Service business development can be seen as one of the biggest opportunities to manufacturing companies to succeed in highly competitive markets.